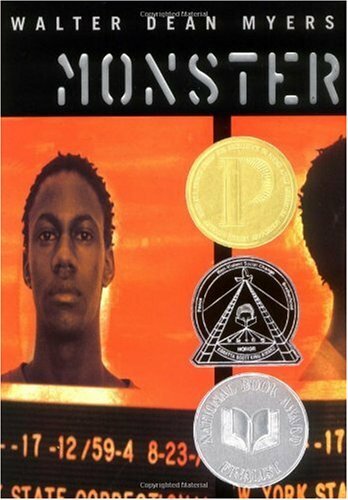 Walter Dean Myers' Monster is about Steve Harmon, a teenager in prison on trial for murder. The book is written as a screenplay from Steve's point of view, with cues for lighting, credits, and people entering and exiting the screen. There are also parts in between, in which Harmon speaks directly to the audience about how he's gotten to this point in his life. As you can tell from the cover, this book has won numerous awards. I especially wanted to read it after finishing The Enchanted, because I feel like I should know more about the criminal justice system. This book felt a little too young for me. I could understand Steve's path and I enjoyed the screenplay, but there was a lot less about his background and life before he got into prison than there was about the trial itself. I would have preferred a bit more character development to balance the courtroom drama. Monster certainly highlighted the difficulties of working within the US jury system, though, especially when you are young, black, and poor. I also enjoyed the audiobook production - multiple narrators and great editing. 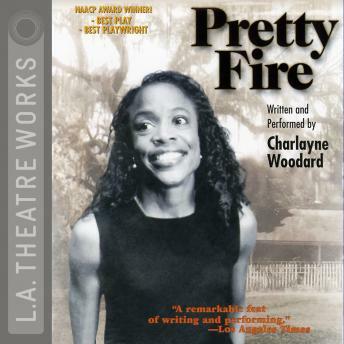 Charlayne Woodard's series of fove vignettes assembled together under Pretty Fire was a fantastic read, and I wish it was much longer. It clocks in at just about 2 hours on audiobook, so if you could find a physical copy to read (which does seem difficult), then you could probably read it super-fast. Woodard starts with telling us about her very premature birth, growing up in New York City, visiting her grandparents in the Jim Crow south, and working hard to succeed and make her family proud of her. The title Pretty Fire relates to the way she and her sister described the burning cross that the KKK left on her grandparents' lawn. Her grandmother told her very firmly that it was not pretty, but the ugliest thing she would ever see. Told with humor (she tells the audience how she grew up wanting to be Lassie the dog, or the black butler in Little Orphan Annie), Woodard really engages with her audience in a way that brings the audiobook to life. I wish I could see her perform in person! Apparently, there are a few companion pieces to this one. I absolutely plan to check them out! Such a great introduction to this talented performer, and one that reminded me (again) that I really enjoy short stories. Highly recommended. I just bought Monster for the library system where I work. It sounded interesting and we have nothing by the author. We're not too hot on African-American authors, but we are in Ireland, so I'll use that as an excuse. I'm hoping to read it myself at some stage, so I'll let you know what I thought when I do. Pretty Fire sounds good, I'll have to see if that is available over here. I'm always looking for good audio books for the car so thanks for the review of Pretty Fire. Monster is in my TBR stack since I wanted to read a book by Myers. Thanks so much for hosting #Diversiverse! Monster is one of my favorite books of all time. I think the lack of character development is that it's all about perception. Middle and high school kids love that book, btw. It will pass from student to student pretty quickly.